In 2019, there will still be a shortage of housing and high demand from buyers, which is great news for sellers. Fewer options for buyers mean you can list at a higher price. It also means buyers may be worn out from a long house hunt and will be extra motivated to finally find a place of their own. But just because there’s a housing shortage overall doesn’t mean automatic bidding wars. You’ll have to look at your local market to see what’s happening in your area. Remember too that once winter ends, new home construction will likely pick up. So, putting your house on the market early in the year is a good idea if you want to take advantage of the low housing stock. At the beginning of 2018, interest rates for home mortgages were low. But they’ve been rising steadily ever since. Experts project the trend to continue into 2019. What does that mean for you? Well, it’s a bit of a mixed bag. Buyers who are watching interest rates may be motivated to purchase a home before rates go up any higher. This is good news for you. But then again, if you’re selling, you’re probably also buying soon afterwards, and you’ll have to face those same high rates yourself. If you know you want to sell, consider getting your home on the market sooner rather than later to avoid the higher rates to come. If you’re a hero looking to sell your home, sign up with Homes for Heroes and we’ll match you with a mortgage specialist who can help you better understand interest rates. Our real estate specialists can also help you make sense of the housing market in your area and come up with a strategy so you get the best price possible. But more than anything, they’ll help you save money throughout the entire process. The economy saw strong gains overall in 2018, and forecasters predict moderate growth will continue. Some analysts say a slight backslide is possible, which has historically been the case after robust periods of growth. So, we could see some growth, some losses, but overall the economy is expected to stay relatively stable. And when it comes to the housing market, stability is everything. People feel more confident buying a new home, and if your area is doing particularly well economically, it could mean more money in your pocket. Spring and summer months are typically the most active periods for people buying and selling a home. So, the end of the year is a good time to get your home ready to sell. Most people don’t want to move in the winter, and the process of selling your home can take some time. So, prepping your home now would help meet that timeline and get you positioned for the busy homebuying season. Remember, competition is good for sellers. When it comes to selling your house, getting top dollar is always a main goal. By working with Homes for Heroes, we can save you money on your real estate transaction, title fee, and home inspection fee. 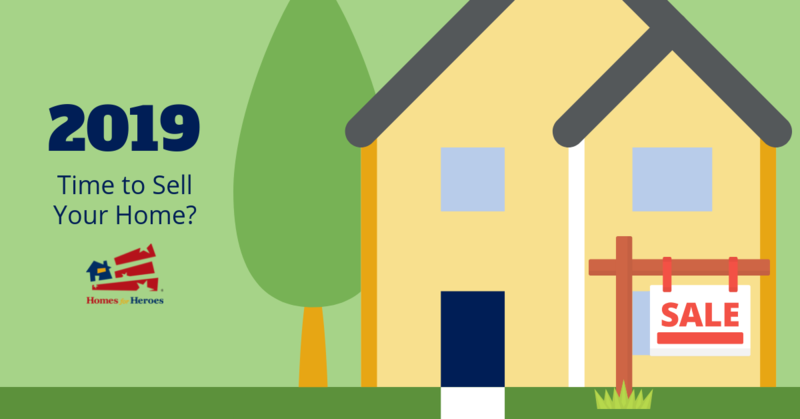 If you buy a new home through us after your sale, we’ll even send you a check after closing. On average, our heroes save $2,400 when buying or selling, do both and save $4,800. Thinking about selling your home? Sign up with Homes for Heroes and our specialists can guide you through the entire process to put the most money in your pocket.